Nothing is more important than the safety of our employees and our customers. At Matthews Roofing Company Inc., we are committed to continually providing, developing and maintaining a safe and healthy work environment for all employees. This statement of policy reflects the importance we place on an accident-free work environment. This dedication to keeping all of our job sites safe begins the day you request a roofing inspection. All company employees are charged with providing the safest work environment possible. We inspect ourselves on a regular basis and go through great lengths to make sure that safety is part of the planning process. 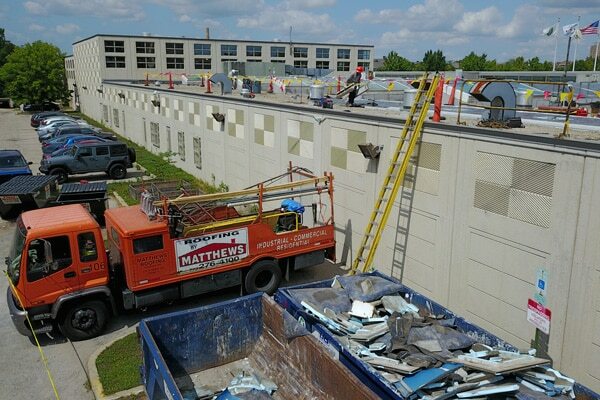 From initial hiring orientation, ongoing safety and health training to jobsite meetings and inspections, Matthews Roofing can provide you with a safe project from beginning to end. We offer extensive training programs to eliminate confusion about handling of materials and procedures. We have an extensive communication system that links all aspects of our operation to allow for quick answers and immediate attention to problem areas. We perform job inspections on a daily basis and have tool box talks weekly. Most all of our men have completed the OSHA 10-HOUR CERTIFICATION COURSE or in the process of completion. Our Superintendant and Safety Director have also completed the OSHA 30-HOUR CERTIFICATION COURSE.